Today on the Doc On the Run Podcast, we’re talking about what a runner should do if you’re worried the pain under the big toe joint might be a sesamoid stress fracture. Sesamoid stress fractures may be one of the very worst injuries affecting runners. In fact, of all overtraining injuries that could actually seriously put your future of running at risk, it may be the sesamoid fracture that has the potential to ruin your ability to run forever. One day I got a message from a runner who had been ramping up for a marathon. He contacted me because he suddenly developed pain in the ball of the foot under the big toe joint. Sesamoiditis: inflammation of the sesamoid bones under the big toe joint (which doctors call the first metatarsophalangeal joint). You stand on these two little bones. Because they get stressed more when you run uphill, you may develop sesamoiditis or worse, a sesamoid stress fracture, when doing lots of hill repeats. If you push right on the hard little bones, and one hurts more than the other, it is probably some injury to the sesamoid bone, such as sesamoiditis or a sesamoid stress fracture. Flexor Hallucis Longus tendinitis (FHL tendonitis): strain, inflammation and/or micro- tearing of the tendon that pulls the big toe down against the ground allowing you to push off when you run. The sesamoid bones are actually embedded within the FHL tendon. If you push right under the big toe joint and the whole area is tender (and doesn’t really hurt more on one specific sesamoid bones) it may be FHL tendonitis. If you pull upward on the big toe (away from the ground) you will stretch the FHL tendon. If this hurts, FHL tendonitis is likely. Sesamoid Stress Fracture: a tiny little crack in one of the sesamoid bones from too many hill repeats and or too much running volume. If this is the cause of your foot pain, it will hurt more on one sesamoid than the other, it will also hurt when you pull the big toe upward, and your foot will most likely be swollen and/or bruised. The best way to diagnose a stress fracture of the sesamoid bone is with an MRI. X-rays don’t always show stress fractures right away. X-rays will only show a stress fracture in a sesamoid that has fractured or completely cracked. Based on this story, however, a sesamoid fracture seems unlikely. The key of course is to make sure you know which condition is causing the trouble. Since we’re mostly talking about sesamoid injuries here, I will just say that the FHL tendon hurts when you move the big toe up and down. It is also much less frequently causing pain in runners. We will discuss it in more detail and later episode. Sesamoid injuries seem to be much more common and certainly much more serious. So first and foremost, you want to make sure that you don’t miss a sesamoid injury. The sesamoid bones are the two smallest bones in your foot. Sitting underneath the big toe joint these little kidney bean sized bones are critically important, yet vulnerable to injury. The patella is a roundish bone that is embedded within the patellar tendon. The external surface of the knee cap is covered with the tendon that crosses the knee connecting the powerful thigh muscles to the shin bone. The internal surface of the knee cap is covered with cartilage. The cartilage helps the knee cap glide easily and decrease strain at the knee. Under each big toe joint, in the ball of the foot, you have two little sesamoid bones sitting side by side. They are about the size of black beans. The one that is closest to the little toe is called the fibular sesamoid. The other is called the tibial sesamoid. Both of the sesamoids are embedded within the flexor hallucis longus (FHL) tendon. Like the knee cap, they are also covered with cartilage that helps them (and the FHL tendon) glide when you walk and bend your big toe joint. The sesamoid bones tolerate an incredible amount of stress. When you walk, about 50% of all your body weight is transmitted through the big toe joint. That means that about one quarter of all your weight is supported on a little bone about the size of a black bean gliding along the bottom of the first metatarsal bone as you push off at the ball of the foot. When too much stress is applied to the sesamoids they can become irritated, painful and inflamed, a condition known as sesamoiditis. In the mild cases, sesamoiditis is really a form of tendinitis because it is the FHL tendon that is irritated. But if you continue to apply the same offending force to the big toe joint the condition can become much more serious. In some cases the sesamoid bones can even fracture. A cracked or broken sesamoid is a serious problem because they are very difficult to heal. Too much bending of the big toe joint can cause sesamoiditis. If you spend a great deal of time kneeling, which forces the big toe to bend upward (dorsiflexion) you can stretch the FHL tendon and causes FHL tendonitis or mild sesamoiditis. A common cause of this is taking on a weekend home improvement project like installing a new tile floor. 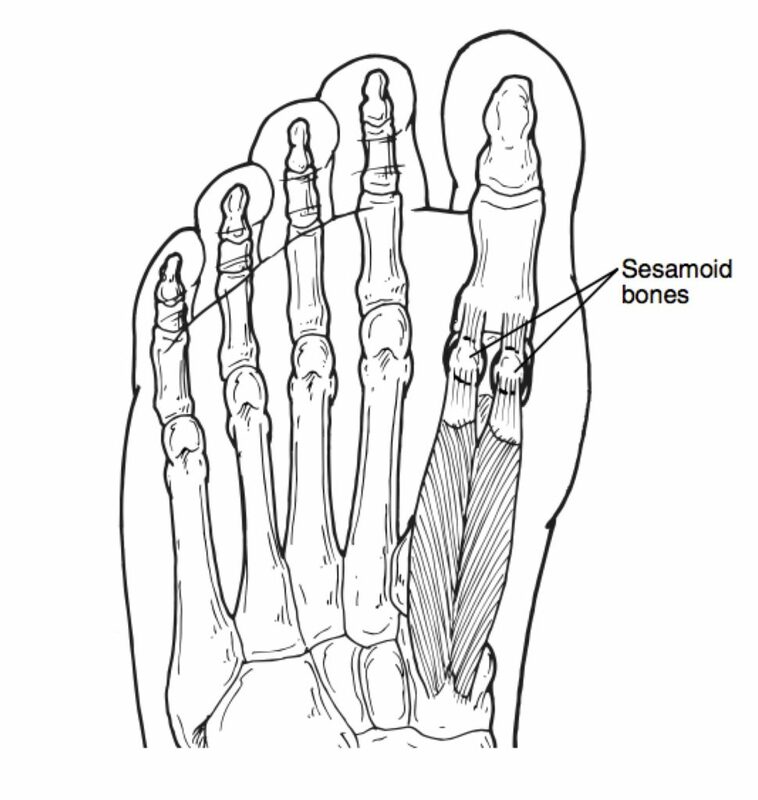 Trauma to the big toe joint can also cause sesamoiditis, even a sesamoid fracture. Jumping of a ladder on a hard surface can cause a contusion (or bruise) of the articular cartilage covering the sesamoid bone. Repeatedly traumatizing the sesamoids by walking on a treadmill at a steep angle can do the same thing. Although the force on a treadmill may be less with each motion, the cumulative stress can have the same result. Elliptical trainers and treadmills cranked up at a steep ankle force the big toe upward, dramatically increases stress to the sesamoid bones. In triathletes I more often see sesamoiditis causes by stiff, poorly fitting cycling shoes. In training for an Ironman or 70.3 triathlon, the increased cycling volume results in a repetitive stress type irritation and injury to the sesamoids. This is often easily corrected with new cycling shoes, custom cycling orthotics or a professional bike fit session. 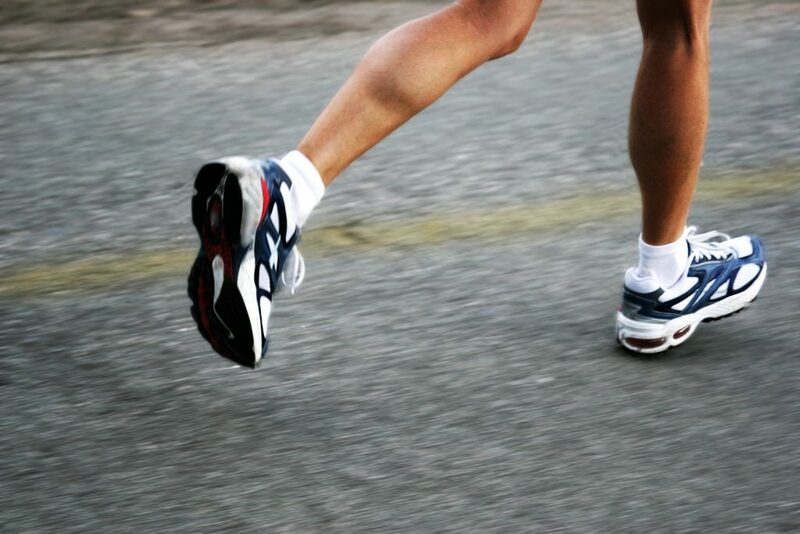 In terms of over training injuries related to the sesamoid bones, most runners will get sesamoiditis first. If they continue to train and continue to ignore the pain under the ball of the foot the chronic stress applied to the sesamoid bone can lead to a sesamoid stress fracture. If you continue to ignore it, the sesamoid stress fracture can get weaker and actually break apart into multiple pieces causing a true sesamoid fracture. Because I see mostly runners in my practice, the most common causes of sesamoiditis I see are rapidly increasing running mileage and running steep hills. This is usually in those training for their first marathon. I don’t see it nearly as often in seasoned marathon runners. Part of this may be that the newbie marathon runner is strengthening many structures all at the same time. The experienced runner typically has better developed neuromuscular connections that allow for better biomechanical efficiency and less stress to joint supporting structures like the sesamoid bones in the foot. When you are training for a marathon, you are applying rapidly increasing loads to the bones, muscles, tendons and ligaments. The muscles are sore and limit your training at the beginning, but they rapidly gain strength. The bones and ligaments (upon which the muscles apply their force) don’t strengthen nearly as quickly. At some point your muscles get strong enough to actually cause tiny little tears in the tendons (known as tendinitis) or cracks in the bone (known as stress fractures). When this happens to the FHL tendon and/or sesamoids in the foot you get sesamoiditis. Hill repeats are one of the most effective tools a runner can use to increase strength and power. However hill repeats put a ridiculous load on the ball of the foot. Most of the marathon runners I see with sesamoiditis have been doing hill repeats regularly for about a month. 2) the experienced runner is much more adept to listening to his/her body. If you have never run long distances you may have a tougher time discerning acceptable muscle soreness from unacceptable joint and tendon tenderness. What is a Sesamoid Stress Fracture? A stress fracture is a tiny hairline crack a bone. This often happens from repetitive stress such as rapidly increasing running distance too quickly. You and your podiatrist cannot see a stress fracture on x-ray when it first starts to hurt. Stress fractures only become visible after your body has tried to heal it. A sesamoid stress fracture may be visible anywhere from 2 weeks to 12 weeks after it becomes injured. X-rays are notoriously unreliable with sesamoid injuries. Just because you can’t see it on an x-ray doesn’t mean it isn’t broken. MRI is a much more effective way to diagnose a sesamoid stress fracture. MRI can show a stress fracture even in its earliest stages. A sesamoid fracture that goes undiagnosed and untreated will invariably get worse. To a runner, chronic sesamoid problems can be a death sentence. So if you become concerned that you have a sesamoid fracture because you kick the ground doing leg swings when barefoot, went a little overboard doing box jumps, or simply accidentally kicked your foot into a door jam, you want to make sure you are treating it correctly. 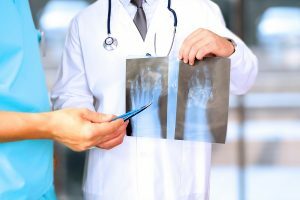 Sesamoid Fracture: How can I tell if I broke the sesamoid, other than an x-ray? The first step to choosing the correct treatment is to make the right diagnosis. You have to know what is wrong before you can fix it. But x-rays aren’t the only way to diagnose sesamoid fractures. In fact, many, if not most of the sesamoid fractures in runners won’t show up on x-ray anyway. Self-diagnosing of sesmoiditis is fairly simple. Lightly press the bottom of the big toe joint with one finger until you feel the hard little sesamoid bones. Press lightly and see if one hurts more than the other. If one is way more tender than the other you will know which one is inflamed. If they are both similarly tender and the sesamoid bones hurt even more when you pull the big toe as far upward as it will go (to the end range of motion), it may be more FHL tendinitis than a true sesamoid injury. If one is exquisitely tender when you press on it, the possibility of a sesamoid stress fracture or broken sesamoid bone becomes seems more likely. If your see a sports medicine foot specialists, the doctor will take a full history of the injury, perform a physical diagnosis take x-rays and determine the exact cause of the injury and pain. If there is question of a sesamoid stress fracture she may order an X-ray or MRI of the foot. You have to remember that the sesamoid bones are very small. The fractures themselves can be tiny. Just a few days ago I saw a runner you came to San Francisco to see me from overseas. He had a sesamoid fracture, Not only on one foot, but on both feet, that wasn’t even mentioned in the x-ray report from the radiologist. So in some cases, even the radiologist can miss the fracture on the x-ray. The first tool doctor uses to make the correct diagnosis is your story. Doctors call it the history of present illness. However all we really do is listen to your story and see if your story is consistent with a sesamoid fracture. If you kicked something hard when barefoot in a way that could fracture the sesamoid, that story of course leads the doctor to suspect you have a sesamoid fracture. This part is not complicated. The doctor will simply look for outward signs of injury, such as redness, bruising and swelling. If it looks injured, the doctor will then check to see if it feels injured. The structure that is damaged is usually the one that hurts when you push on it. When you go to the doctor she will inspect your foot. If you have bruising and swelling in the area of the sesamoid bones, your doctor will probably suspect you have the sesamoid fracture, or another structure very close to the sesamoid bones must be injured. By palpating or pushing directly on each of the sesamoid bones individually, the doctor will try to determine whether or not a sesamoid bone is in fact the injured structure. In some cases doctors will order additional test, such as x-rays, MRI, CT scan or blood tests. These tests give your doctor additional information. But it’s really just additional information to support your history and physical exam. Although most runners think that x-rays are the only tool used to diagnose fractures, you have to remember that for thousands of years before the technology of x-ray imaging was developed, people were still getting fractures. 200 years ago if a horse stepped on your foot, you would not get an x-ray. In the majority of cases, when I see an injured runner I can make a diagnosis without an x-ray. X-rays may help the patient understand the injury, but they’re not important in all cases. If you and I were on a run through the Amazon jungle, and you kicked a large root in your minimalist running shoes, I would examine your foot and try to determine whether or not you broke anything. Of course, in the middle of the Amazon jungle I would not be getting an x-ray. Based upon your story, the examination of your foot and your response to treatment we would be able to determine the severity of your injury. We could do all this without an x-ray. 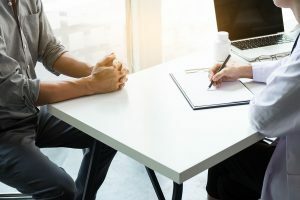 The fourth tool doctors use to make a diagnosis is your response to treatment. If I do everything in my power to treat your sesamoid injury in the middle of the jungle, and you can run without pain, that tells us an awful lot about your injury. If you have no improvement with the subtle and simple sesamoid treatments, it would certainly imply that you have a more significant injury. Although many doctors will simply get x-rays on everybody who comes into the office with foot pain, it’s not always necessary. If you have a stress response or a sesamoid stress fracture nothing at all will show up on your x-ray initially. Even if you have a lot of pain in the ball of the foot, your sesamoid may look totally normal on x-ray. And again, as I mentioned earlier even if you do have a real fracture the doctor might miss it. A CT scan gives you more information than an x-ray because it’s basically like having 1000 x-rays of your foot. It is much better than x-ray showing you the subtle sesamoid fractures. An MRI shows inflammation much better then x-ray or CT scan. An MRI is most often used to make the diagnosis of a sesamoid stress fracture. But the problem with an MRI is that it does not really distinguish between mild sesamoid stress fracture versus severe sesamoid stress fractures. So even if you want to get an x-ray, an MRI or a CT scan of your foot because you suspect you have a sesamoid stress fracture you have to take your story, the physical exam and your response to treatment and combine all of them to develop the best treatment plan. When I go to medical conferences and lecture to physicians on running injuries my primary task is to help them understand how to customize treatment for runners with specific running injuries. Runners have to make sure that they avoid standardized treatment protocols made for inactive, sedentary patients. So when you think about your sesamoid treatment plan, make sure you strategically stay active so you don’t lose all of your strength, fitness and flexibility. Sesamoiditis is treated based on the extent of injury. The main point is that it must be taken seriously. Sesamoiditis that is under-treated or ignored may get significantly worse leading to a broken sesamoid bone, arthritis of the sesamoid bone, surgery, chronic pain and permanently altered biomechanics. In the worse cases a condition known as “sick-sesamoid-syndrome” develops and leads to a sesamoid bone that has to be surgically removed. This is not good. If you remove one sesamoid bone, the other can become arthritic, the big toe can drift left or right causing a bunion or other deformity to develop. Stop the Activity that Caused the Sesamoiditis! This may seem obvious, but if you got sesamoiditis while you have been running hills…stop. If you have been walking on a treadmill with it cranked up at a steep angle…stop. If you started to get pain in the sesamoids while using an elliptical trainer…(you guessed it)…stop! Try to avoid anything that forces you to stand up on the toes or forcibly bend the big toe upward. One of the simplest ways to relieve irritation and pressure to the sesamoids is with a “dancer’s pad.” This is a felt or gel pad that has a cut-out under the big toe joint. The idea is to move the pressure away from the sesamoid bones and transfer it to the ball of the foot under the second, third and fourth metatarsal heads. If the pad is placed correctly, this can allow the inflammation to decrease and the sesamoiditis will heal. Put the pad on the foot, draw a line around the area to offload and cut it out. Keep the pad in this location to offload. The pad may stay in place well with a sock on. If not you can tape it in place. The sesamoids are stressed most at the end range of extension at the big toe joint (bending the toe all the way upward) when you walk. By taping the big toe to limit this motion, you can transfer some of that stress to the tape and help heal the sesamoids. When performing sesamoid taping, the best type of tape called “elastoplast” or “tensoplast.” It is strong, very adhesive and has a slight stretch. The best shoes for sesamoiditis are very stiff and have a rocker sole. Dansko clogs are probably the best example of the ideal shoe to decrease the load to the sesamoid bones. Because clogs are so stiff, the big toe doesn’t bend when you walk. In addition the forefoot or sole is curved so that your foot actually rolls and further decreases pressure to the ball of the foot. Wearing the right shoes is sometimes enough to allow the sesmoiditis to heal on its own. Hoka running shoes are specifically designed with a similar technology built into them. Hoka’s have an active foot frame and a stiff meta-rocker under the forefoot sop they help you roll across instead of pushing off and bending the big toe joint. Theoretically, this could reduce stress to the sesamoid bones. Corticosteroids are the very best way to stop the inflammation that causes pain from arthritis, tendinitis or even sesamoiditis. But steroid injections come with a price. Corticosteroids are great at breaking up collagen bonds. If the goal is to stop pain and get back in the game, that is a good thing. If you are trying to break up scar tissue, this is a good thing. If you happen to have tears in the FHL tendon (made of up of highly organized collagen fibers) or a bruise or damage to the articular cartilage, that is a bad thing. The problem can become much worse. Steroids can actually weaken the cartilage and ligaments. Steroid injections should only be used with the intent of breaking up a chronic cycle of inflammation. They don’t really “cure” anything. They are basically like lubricants for the joints. If the sesamoids have been injured for a long time and you have developed arthritis sesamoids, hyaluronic acid injection may help. Supartz and Synvisc are the two types. They are both FDA approved to treat arthritis of the knee, but sports medicine specialists who treat runners and triathletes often use these in arthritic ankles and big toe joints. 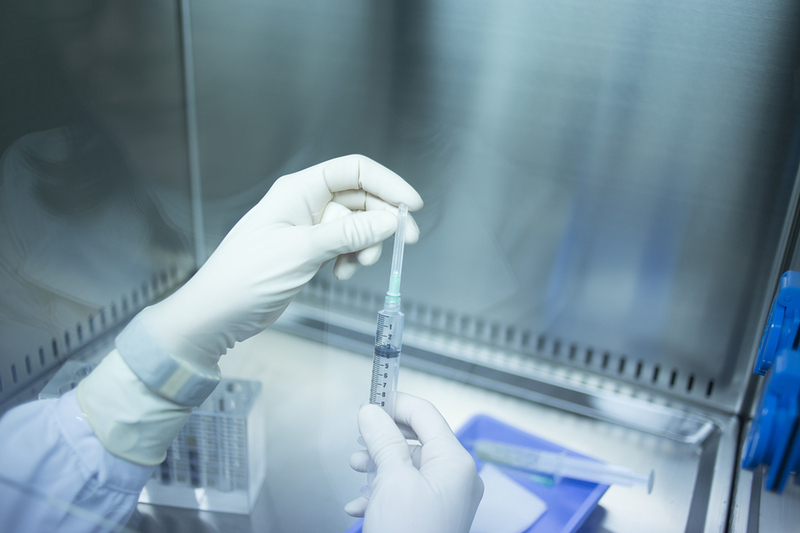 These injections serve as a joint lubricant and are a more natural alternative to steroid injections. If the sesamoiditis is really just micro-tearing to the FHL tendon instead of a real injury to the sesamoid bone or sesamoid cartilage, it is possible to induce healing through a PRP injection or a stem cell injection. Both PRP and Stem Cell injection uses your body’s own cells to stimulate new capillary formation in an injured tendon, and rapidly repair a tendon that has been chronically injured. Based on that idea, there is some theory that these advanced injections may make sesamoid injuries heal faster. However, these are off-label uses. A bone stimulator is one of the most effective methods to heal a stress fracture or completely broken sesamoid. As long as the crack is small and the pieces of bone haven’t moved apart a bone stimulator can help your body form bone and heal the fracture faster. You have to consider all of these advanced treatments because it is really important to get the sesamoids to heal without surgery. But in some cases, sesamoiditis or sesamoid fractures might need surgery. If the fracture is “displaced” (meaning that that broken pieces have moved apart) surgery may be necessary to put the pieces back together using surgical wire or tiny little screws. When sesamoids fractures are ignored, they can be severely arthritic. If this happens surgical removal of the sesamoid bone may become the only option. Surgically repairing sesamoid fractures is impractical. They are very small bones. If your doctor says you need surgery on a sesamoid bone, get a second opinion from a running expert immediately. What to do if you think you have Sesamoiditis? If you think you have sesamoiditis you have to stop the activity that caused the injury. You have to stop the activity that causes the injury. If you don’t, it won’t get better. Take it seriously. Stop running, cycling, walking uphill and avoid any activity that causes the big toe to bend upward. Ice the ball of the foot 2-3 times per day for 10 minutes. Wear compressive socks to decrease the swelling, even if you don’t think it is swollen. Keep the foot elevated when you are resting. Wear the stiffest shoes you can find. Dansko clogs and super-stiff backpacking boots are the best. Tape the big toe with tensoplast tape to keep the big toe joint still. If the pain under the big toe joint doesn’t go away in a week or less, seek help from a sports medicine physician who treats these injuries in runners often. Sesamoid fractures are serious business. Sesamoid injuries can also be very difficult to heal. But, if you and your doctor are thoughtful about the causes of stress applied to the sesamoid bones, and you are diligent about finding ways to stay fit and maintaining your strength, you can heal and get back to running. Remember the goal isn’t just to heal the injured sesamoid. The goal is to run!